Welcome to our Wedding Directory, we have a wide selection of categories for all your wedding needs. Please use the buttons on the right to start searching our wedding directory. Every month Pure Wedding Index features a wedding supplier from our directory, please see below for this months featured supplier. Flowers play a huge part in your wedding planning and your wedding bouquet is definitely the most special element. Whilst it used to be tradition to throw your bouquet to your female wedding guests at the end of the wedding, nowadays brides tend to be more meticulous about letting go of something so personal, so what better than to have a beautiful handmade silk bouquet that you can treasure forever. 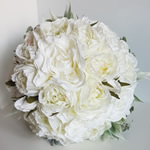 The Bouquet Studio use only the highest quality silk and artificial flowers and each bouquet is lovingly handmade. 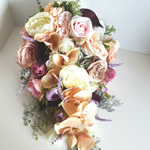 As well as creating stunning bridal bouquets, you can also have buttonholes, corsages and bridesmaids flowers made too. They will work closely with you to meet your individual requirements ensuring you have the bouquet you desire on your special day. "Recieved our flowers today, they are beautiful and very well packaged. Loved the little gift in there to, very thoughtful. Service has been impeccable! Would definitely recommend to anyone needing flowers!